New this year, we’re adding a 5km/10km run and 5km walk to our landmark Becel Heart&Stroke Ride for Heart event. For the first time ever you can now experience the magic of the traffic-free Gardiner on two wheels or two feet. Be part of history and fundraise to help create more survivors. Take part in Toronto’s ultimate fundraising event with the CN tower as your backdrop. 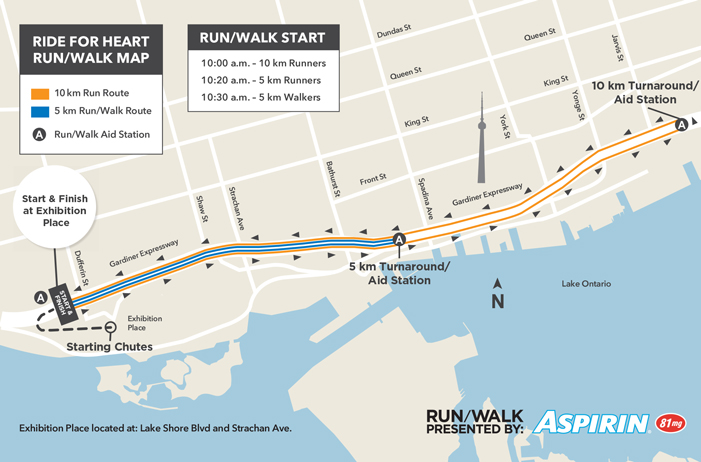 Here are some Frequently Asked Questions about the new run/walk. What is the date of the Run/Walk? The Run/Walk will take place on the same day as the Ride for Heart, Sunday, June 5, 2016. No, riders and runners/walkers will never intersect on the route at any time. Depending on route length, riders will start the route from 6:00am - 9:00am and runners/walkers will begin after 10:00am. What is the itinerary for the Run/Walk on June 5? 5:30 am Check-in for General Participants, Queen Elizabeth Building. Only for participants who require a bike plate or run/walk bib. Check-in closes at 8:30 am for riders, 9:30 am for runners, 10:15 am for walkers. VIP & Corporate Participant Services, Better Living Centre. General Participant Services, Queen Elizabeth Building. Do you have any training programs for the Run/Walk? We are happy to provide you with the following training programs for the Run/Walk. Good luck with your training and we can’t wait to see you on June 5th. Yes, timing services will be provided by SportStats. Runners and Walkers will be timed by way of bib tags attached to their bibs. Bibs are distributed through mail for participants that have raised $100 online by May 1 or in-person at the Check-in Centre or event day. Do not remove the chip from the bib. Do not fold the bib or excessively bend or twist the chip. Wear bib on chest/abdomen. with a chip attached to it. The chip will be will used to recognize participants as they cross the finish line, but will also have the added benefit of timing your run or walk. While we are not a competitive event, this is an added benefit to your experience with the Ride for Heart. The paved course is mostly flat, with the exception of the on-ramp to the Gardiner Expressway eastbound start line. This is a 180 degree arcing right turn on a slightly downhill on-ramp, so all participants must take the necessary precautions to ensure their own personal safety and the safety of others while on this ramp. Participants will use this same ramp, going uphill, to exit the course. After crossing the Finish Line, participants go back up the on-ramp and follow a dedicated chute to the finish area General participants to the refreshment tent and then to Heart Park, and Corporate and VIP participants towards Heart Park and the Better Living Centre. What is the wheelchair information? Yes, in the Queen Elizabeth Building for General run/walk participants and the Better Living Centre for VIP and Corporate run/walk participants. A clear bag with a drawstring will be included in the Participant Packages for runners and walkers and is sized so that all bags checked will fit in the bag check areas, ensuring efficiency at both check-in and pick-up. These bags must be used to check-in belongings no other bags will be accepted. A sticker will be included with your bib that corresponds to your bib number. The sticker must be attached to the bag in the spot indicated. It is strongly recommended that valuables be left at home. The Heart and Stroke Foundation is not responsible for lost or stolen property, including any and all property checked in the Bag Check areas. What is the registration fee and fundraising requirement to run or walk? The registration fees for runners and walkers are identical to participating in the Ride for Heart. Please refer to the Registration Fees chart for more information. Each participant (18+) must raise a minimum of $100 outside of their registration fee to be able to participate as a rider, runner or walker in the Ride. In order to participate in the Ride for Heart, participants need to raise the minimum fundraising amount by event day. Click here for tips on how to reach your fundraising goal. Keep in mind that if you’d like to be a VIP or if you’re part of the Paramedic Challenge, you have to raise at least $1,000. Whatever your goal, you can do it! Absolutely, if you choose to become a VIP runner or walker and raise $1,000 or more, you will receive all of the same benefits that a VIP rider does, except you will receive a technical running shirt instead of a cycling jersey. "The Ride for Heart should be on everybody’s Toronto must-do list." Register Now! Donate Now! Fundraise Now! Volunteer Now!